OUR HERBAL WELLNESS COLLECTIONS ARE BEAUTIFULLY PACKAGED IN A LOVELY RUSTIC HAND MADE ROUND BIRCH BARK CONTAINER - THEY ARRIVE DECORATED WITH A SEASONAL HERBAL BOUQUET, READY TO BE GIVEN AS A GIFT, FOR ANOTHER OR TO YOURSELF! CUSOM HERBAL PACKAGE - We'll help you design a GET WELL BOX that contains items designed to support the specific health needs of the recipient...whether its recovery after surgery or a bout with the flu, a new mother and babe, or a box of herbal goodies to lift the spirits, we can help! 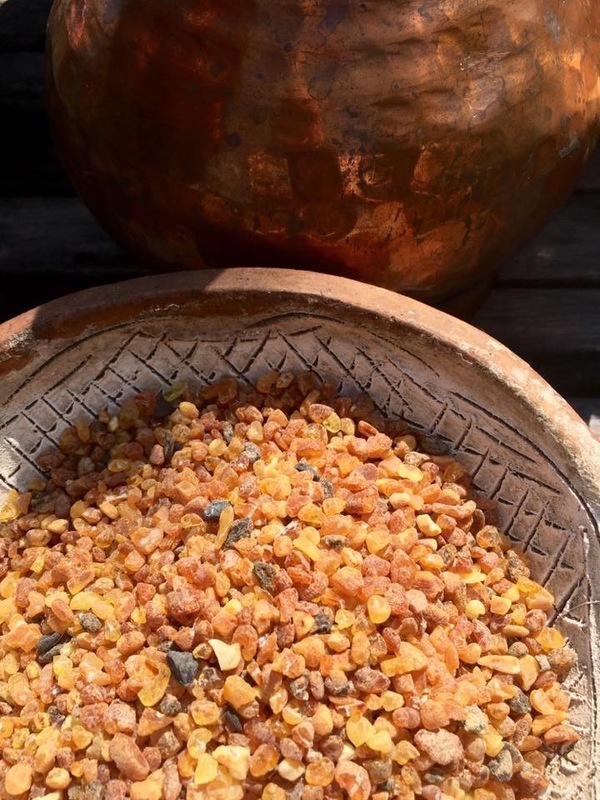 This is a collection for those who would like to get to know the benefits of Baltic Amber as traditional medicine. The box contains a Baltic Amber tincture, Baltic Amber oil, a jar of Amber Rose Butter and a tin of Amberose Petals (lozenges for sucking" and a bottle of Baltic Amber hydrosol, all beautifully packaged in a lovely pine storage box with hinged lid and seasonally decorated with cedar and pine greens and a cinnamon spice Christmas decoration. THIS BOX CONTAINS A 4 OZ. BOTTLE OF ELDERBERRY SYRUP, AN 8 OUNCE BOTTLE OF VENDETTA DELLA VESUVIO, A BOX OF HERB TEA - THROAT & TUMMY TAMER. DEEP SLUMBER OR MAINE BIRCH BERRY - A SMALL JAR OF GINGER OR GARLIC HONEY. packed beautifully in a round hand made birch bark container suitable for multi uses. The boxes are heavy and shipping via USPS costs $20 per box. We set the price of the Wellness Packs at $50 and added the shipping charges for a total of $70. Winter ushers in a time of deep diving - deep sleep, deep rest, deep dreams and potent divination. We all come from a long line of ancestors who welcomed the darkest time of the year as a time to sleep, dream and heal. My ancestors built healing dream temples and believed dreams to be portals into the work of the soul. They taught that guidance through dreams flows most easily during the dark of the year. Herbs such as mugwort, lavender, violets, skullcap, roses and more, can be especially supportive allies as we rest our bodies and embrace the inner work of the dark season of sleep, healing, divination and dream. We've poured our creative energies into preparing this SLEEP, DIVINATION & DREAM package, a gorgeous collection of herbal support for your sleep and dream journey this winter, decorated with evergreens and beautifully arranged in a handmade birch bark container. Mugwort is well known to encourage dreaming, enhance lucid dreaming and aid dream recall. Lavender, violets and skullcap all promote deep, restorative sleep. Try rubbing some of our DREAM BALM on your temples and forehead before going to sleep at night. Sip a cup of our DEEP SLUMBER HERB TEA (skullcap, miky oats, lemon balm and roses) with a few drops of SOPORIFIC FORMULA (skullcap, California poppy, passionflower) and relaxing KAVA HONEY added�tuck a gently aromatic DREAM PILLOW (mugwort, lavender, oats, roses) under your pillow, spray a bit of our gorgeously aromatic, copper distilled LAVENDER HYDROSOL around your face while burning some of our DIVINATION BLEND incense�Sweet dreams! Our SLEEP, DIVINATION AND DREAM COLLECTION includes a container of our delicious Deep Slumber Herb Tea, a fragrant Dream Pillow, a jar of Dream Balm, a jar of kava honey, a bottle of Soporific Sleep Formula, a lavender hydrosol and a hand rolled Mediterranean divination blend incense stick, all beautifully arranged in a rustic, hand made round birch bark container. Beautifully packaged in a hand made round birch bark container: EACH PACKAGE CONTAINS TWO HAND ROLLED INCENSE STICKS, A WOODEN CONTAINER OF FRANKINCENSE AND MYRRH RESINS, THREE SMUDGE STICKS AND A PRAYERS FOR THE WILD HEART TRIBE BOOK. CONTAINS A STICK OF OUR WOODLAND ESSENCE INCENSE, A STICK OF MEDITERRANEAN BLEND INCENSE, A CONTAINER OF MYRRH AND FRANKINCENSE RESIN, AND THREE SMUDGE STICKS: LAVENDER, MUGWORT AND HYSSOP OR SAGE AND A PRAYERS FOR THE WILD HEART TRIBE BOOK. EACH OF OUR HAND ROLLED INCENSE STICKS WILL LAST FOR MANY BURNINGS.